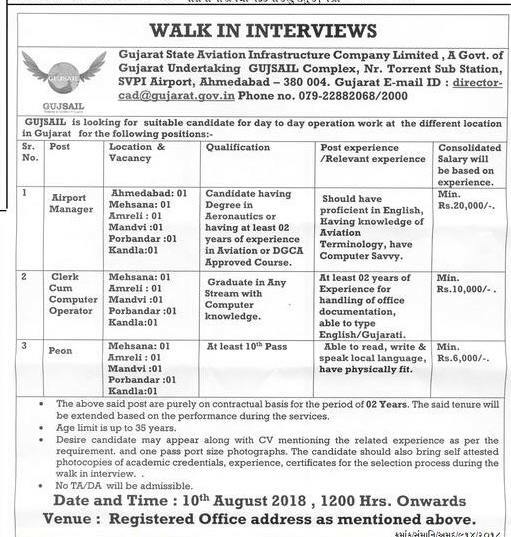 Gujarat State Aviation Infrastructure Company (GUJSAIL) has published Advertisement for below mentioned Posts 2018. Other details like age limit, educational qualification, selection process, application fee and how to apply are given below. How to Apply: the Desired candidate may appear along with CV mentioning the related experience as per the requirement and 1 passport size photographs. The candidates should also bring self-attested photocopies of academic credentials, experience, certificates for the selection process during the walk-in interview. Walk-in-Interview: 10-08-2018 at 12:00 P.M.